With the arrival of our second daughter soon coming, I was looking for a mattress cover and protector for our new bed. We had recently updated to a king and we needed something to protect it from the various occurrences that happen with a baby! I also had found I was more comfortable on our guest bed that had a wool mattress pad on it (more obvious to me at 36 weeks pregnant). 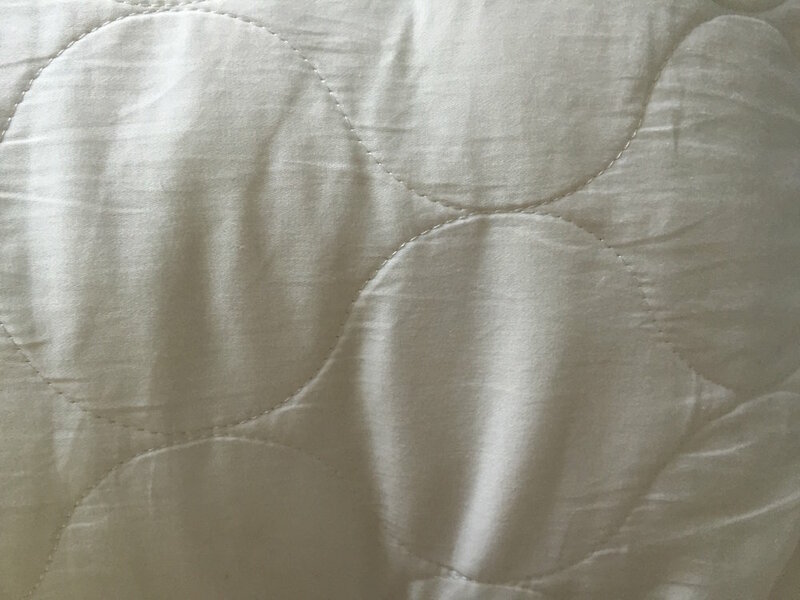 I looked to see what mattress pad we had on the guest bed and it was by Sleep & Beyond. I had done some research a few years ago when buying a pad for our old bed. It is really comfortable and made of wool and cotton (it is called the myPad). For our bed now (king) we got the myDual Pad and myWoolly Pillow from Sleep & Beyond. 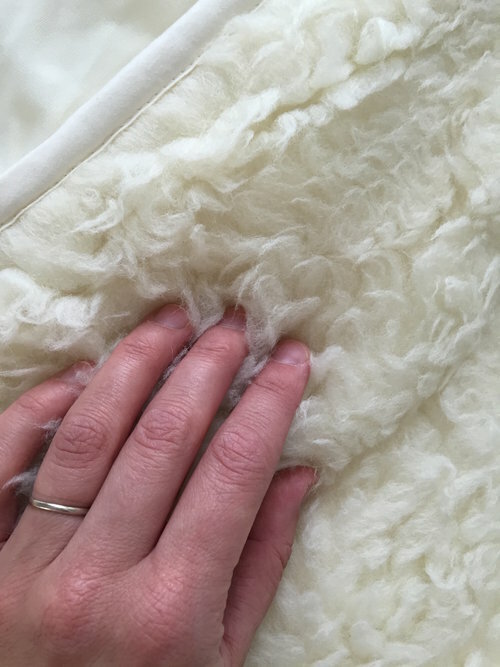 The myDual Pad consists of a cushy side that is 100% wool fleece with no other covering, and the soft side is 100% wool under 100% cotton. 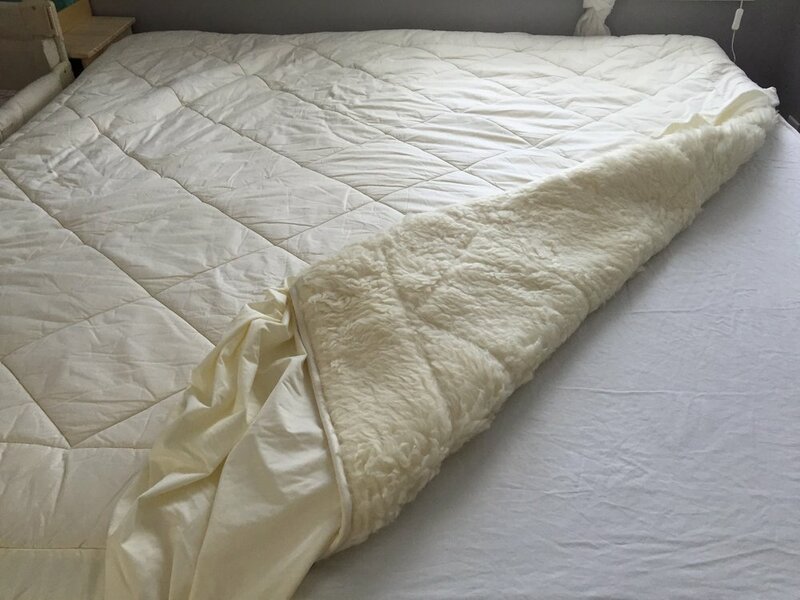 It is nice and thick, very soft, and the perfect amount of padding for our firm latex mattress. It is also thick enough that it seems pretty waterproof to me, even though it isn’t officially waterproof. 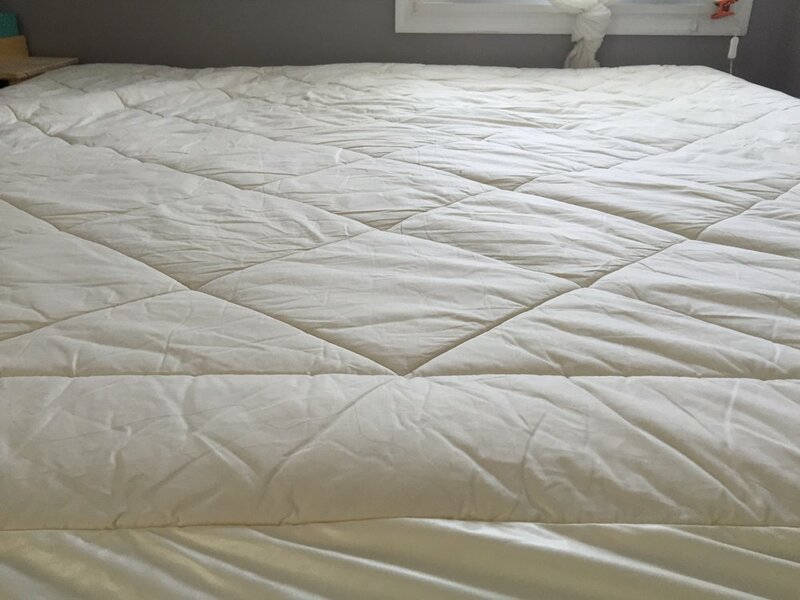 The sides are easy to place over a thick mattress and are made of stretchy waterproof microfibre. 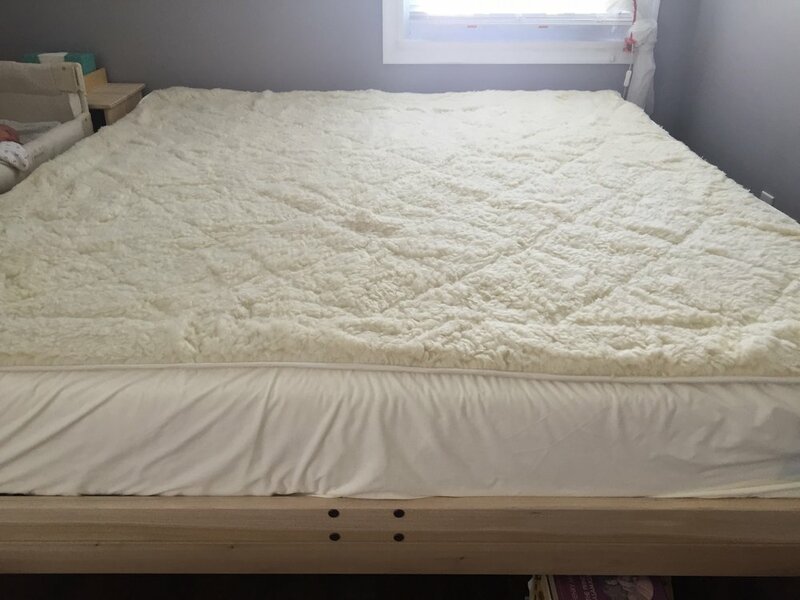 One of the selling points on these mattress pads in particular is that they are washable! In my world that really makes everything easier. 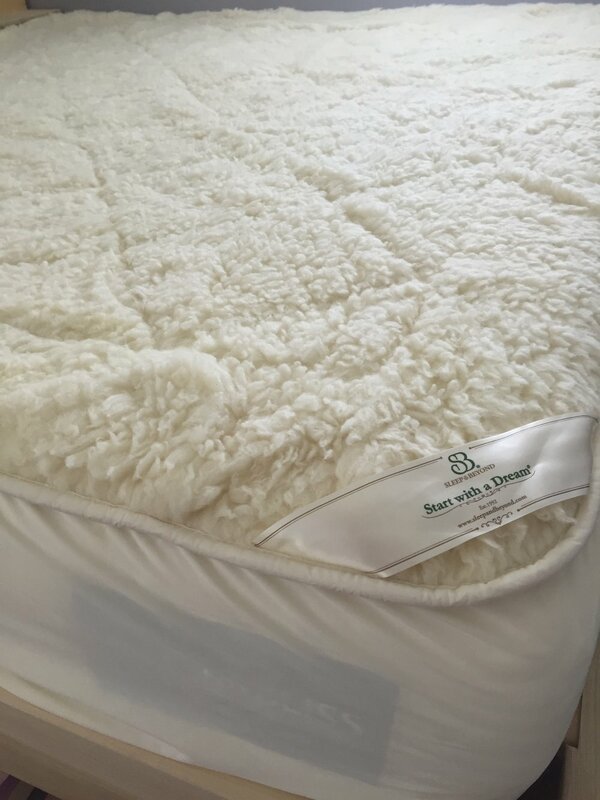 Sleep & Beyond describes it as a Biowash – the way I understand this is that inorganic salts are put on the fiber and make them release O2 as an oxidant, this changes the scaling of the fiber to prevent felting without using any chlorination. 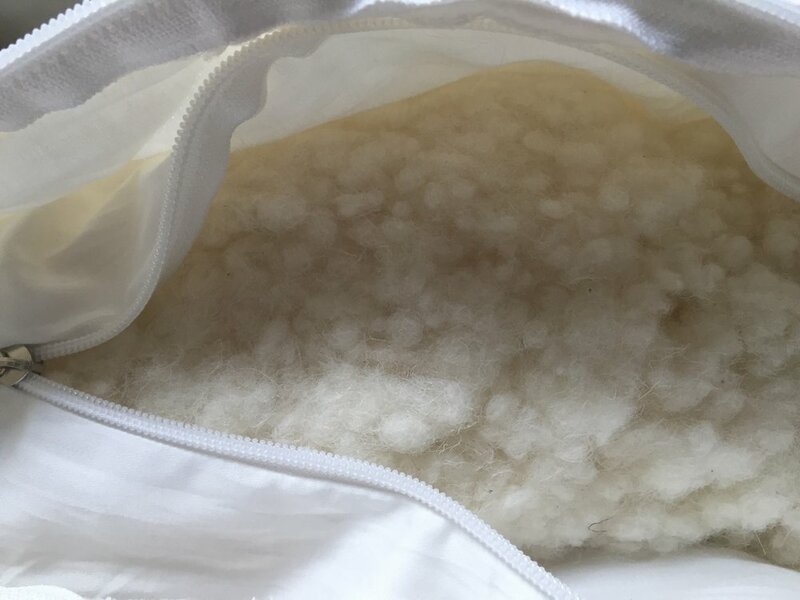 On their website it states that the pad is machine washable, ideally on cold water, and can be dried in the dryer on low or air dried. I have washed it in the machine and have dried it on low and it was overall totally fine. The first time I did this, I dried it for longer in the drier and the material on the sides/skirt stuck together in some parts. It unstuck easily and the next time I dried it, I dried it mostly in the drier and then in the sun for some of the time. The sticking didn’t happen that time around. Since we have the king size, it is pretty big and a little heavy. So, it fills up our washer and dryer and takes a little effort to haul it there, but it does fit and we don’t need to wash it very often at all. 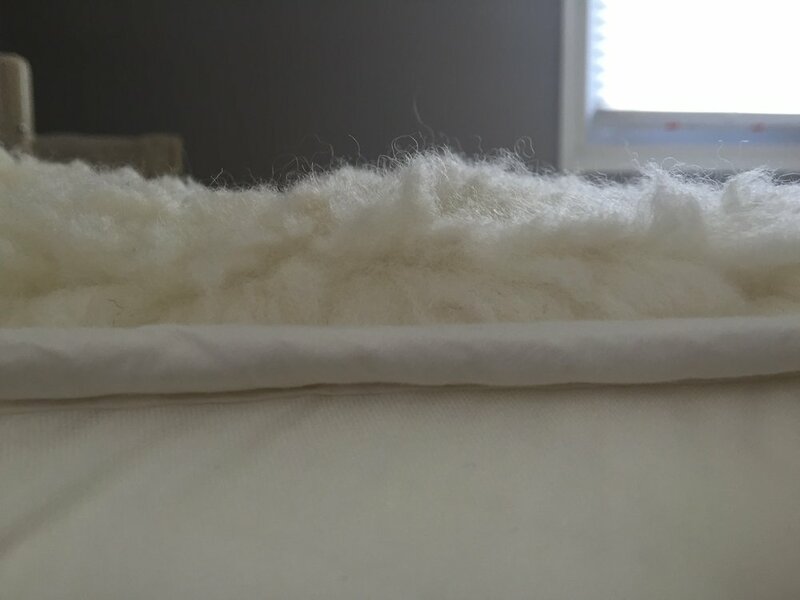 Here’s the wool fleece side up on our mattress, then both sides as it was flipped over, and then the cotton side. Wool naturally wicks away moisture, is flame resistant, and regulates temperature, in addition to being extremely comfortable and 100% natural! The texture is awesome. The wool side is soft and very snuggly while the cotton side is soft and cozy. There is no itch factor in any way, and it does not make me warmer, just a lot more comfortable. Having natural fibers and no chemicals next to your face and your body is very important to me. We spend so much time sleeping, the bed is one of the most important places to try to incorporate these things! Wool is an amazing material, it is breathable, regulates body temperatures – so it is warming in winter and cooling in summer, wool is naturally water resistant, naturally anti-allergenic, and won’t allow the build up of doors. Of the whole part of the mattress and bedding, what is in our pillows is the closest to our face and our breathing. So, investing in a healthy pillow is ideal. 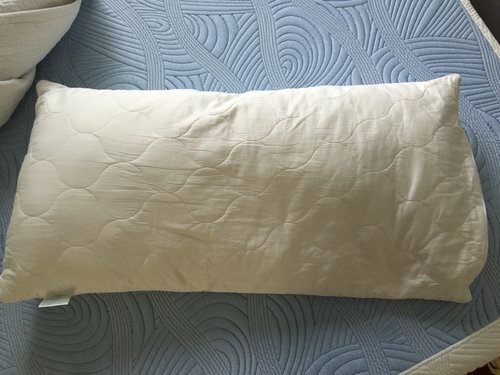 Sleep & Beyond’s myWoolly pillow is an adjustable wool pillow with a quilted cotton cover. It is also washable, which is wonderful,l and you can take out or add wool fill, which is a great feature! 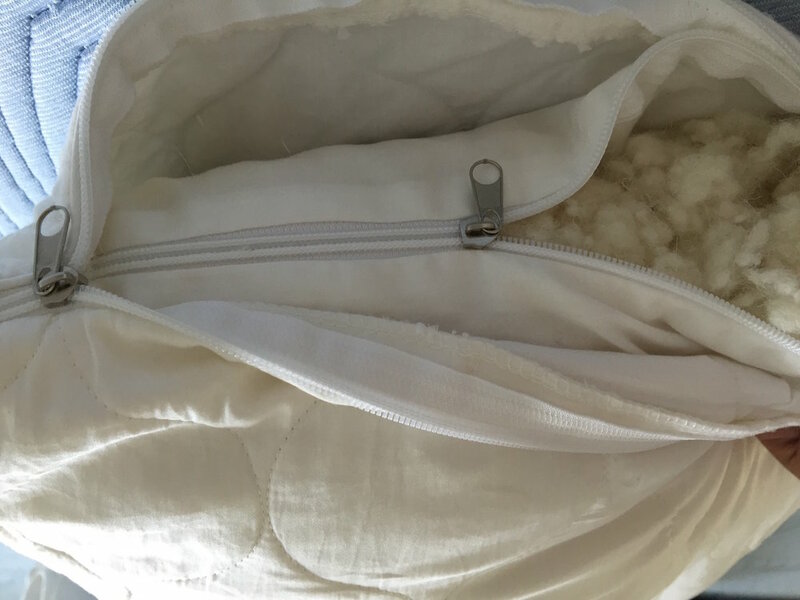 The quilted cotton cover is thick enough so that it protects it, and inside is another thinner cover that holds the wool fibres. 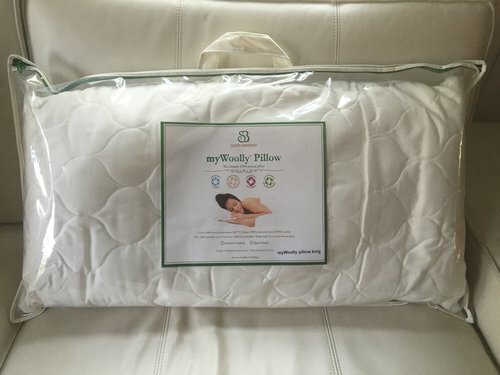 After contacting Sleep & Beyond to do a review, they sent me both of these awesome products. Thanks Sleep & Beyond!